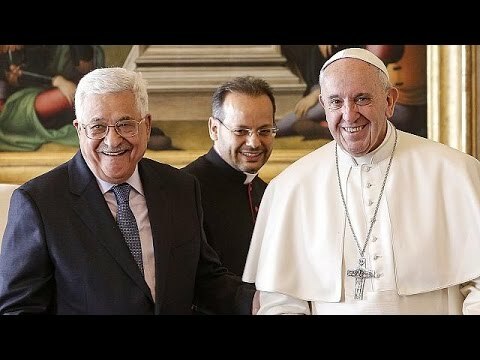 On Saturday Palestinian President Mahmoud Abbas will meet Pope Francis to inaugurate Palestine’s first embassy to the Holy See ahead of Paris peace talks. On Saturday Palestine will open its first embassy in the Vatican, a diplomatically significant development in the midst of ongoing threats by President-elect Donald Trump to illegally move the U.S. embassy from Tel Aviv to Jerusalem, and an international peace conference on Israel and Palestine which begins on Sunday in Paris. Palestine has formal diplomatic missions to over 90 countries and has had official diplomatic relations with the Vatican since 2000. Palestinian Authority President Abbas will also press the Pope about his concerns regarding U.S. threats to move their embassy from Tel Aviv to occupied Jerusalem, a move which would not only break international law but threaten to entirely scuttle Palestinian Authority hopes for a two-state settlement. Palestinian Minister of Foreign Affairs Riyad al-Maliki said Abbas is “hoping that the Pope will participate in sending a strong message” to Trump about the dangers of the proposed move. Trump’s pick for U.S. ambassador to Israel David Friedman- a Zionist extremist who has said Jewish supporters of Palestine are worse than Nazi concentration camp guards- has publicly said that the U.S. embassy will move to Jerusalem. Saturday’s inauguration comes as over 70 countries gather in Paris on Sunday for the opening of the first major international peace talks on Israel-Palestine since 2014, when U.S. sponsored negotiations ended in the face of the Israeli government’s continued construction of illegal settlements. Abbas told a French paper earlier this week that the Paris talks “may be the last chance for implementing” the two-state solution mapped out in 1967 U.N. Security Council Resolution 242 and the 1993 Olso accords. The Paris talks begin just weeks after a historic U.N. Security Council vote which unanimously condemned Israel’s flagrant violation of international law in ongoing settlement construction on Palestinian territory. Despite official hopes that the talks might revive the two-state solution- which would see a contiguous Palestinian state with East Jerusalem as its capital alongside Israel’s 1967 borders- many Palestinians have declared it long dead, given Israel’s continual refusal to abide by international law and multiple previous peace deals.